Farragut makes presentation for Constitution Week. On Monday, September 19, 2016; in honor of Constitution Week, members of Farragut Council No. 11, Knoxville, TN met with representatives of Bonny Kate Elementary School to present to their 5th Grade History Class pocket size copies of the Constitution of the United States. Sixty-Six copies of the Constitution were presented along with a Resolution from Farragut Council to the school. 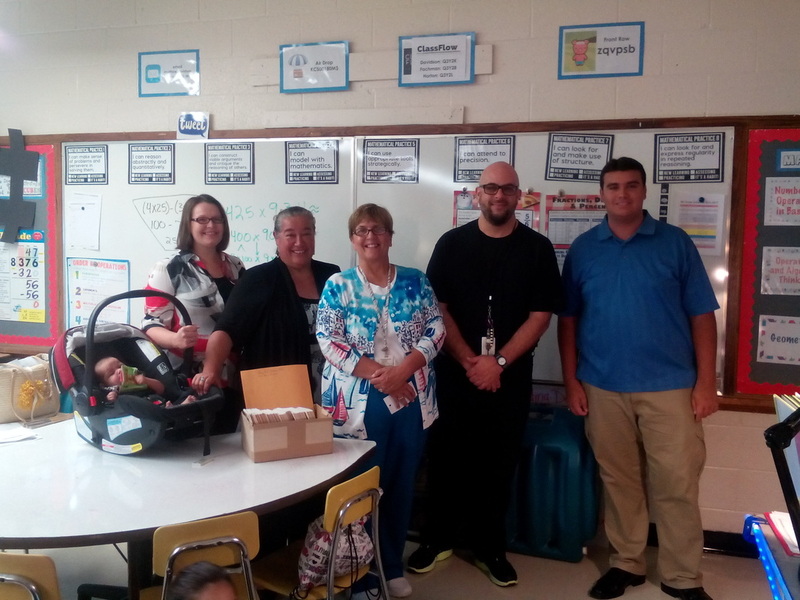 PICTURED HERE (from L - R ) : Shae Coatney, 4 months old; Crystal Coatney, Vice Councilor of Farragut #11; Vickie Smith, Secretary of Farragut #11; Linda Norris, Principal of Bonny Kate Elementary School; Matt Horton, 5th Grade History Teacher; and Kyle Coatney, youngest member of Farragut Council, age 17.